Having owned the remarkable MS68, we can tell you this coin is closer to a MS68 then a MS67. Everything about this coin is remarkable! Amazing surfaces are perfect-yes perfect! We used a strong glass and save for some light clash marks, we found ZERO imperfections anywhere. An incredibly luster glows from all over. At times we think we see traces of semi prooflike mirrors. A beautiful swirling mix of totally pale olive/purple/reddish gold/faint blue colors dazzle from all over. This is NOT a dull or drab coin. Every detail is needle sharp in strike. 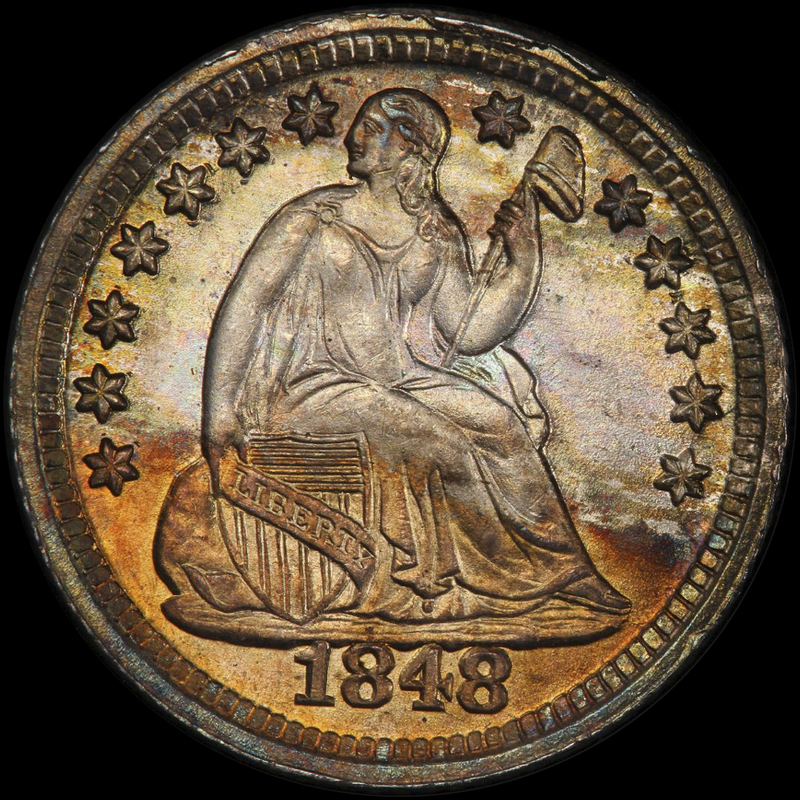 We think this coin was a very early strike as well. The ye appeal is awesome! PCGS 6, NGC 4, CAC 4. This coin last for $12,338.00 in 01/2014. That is pretty much now 5 forever years ago. It has been with the Grayson Collector ever since. The current Collectors Universe Value is $16,500.00. This piece has way too much going for it not be to worth that price. 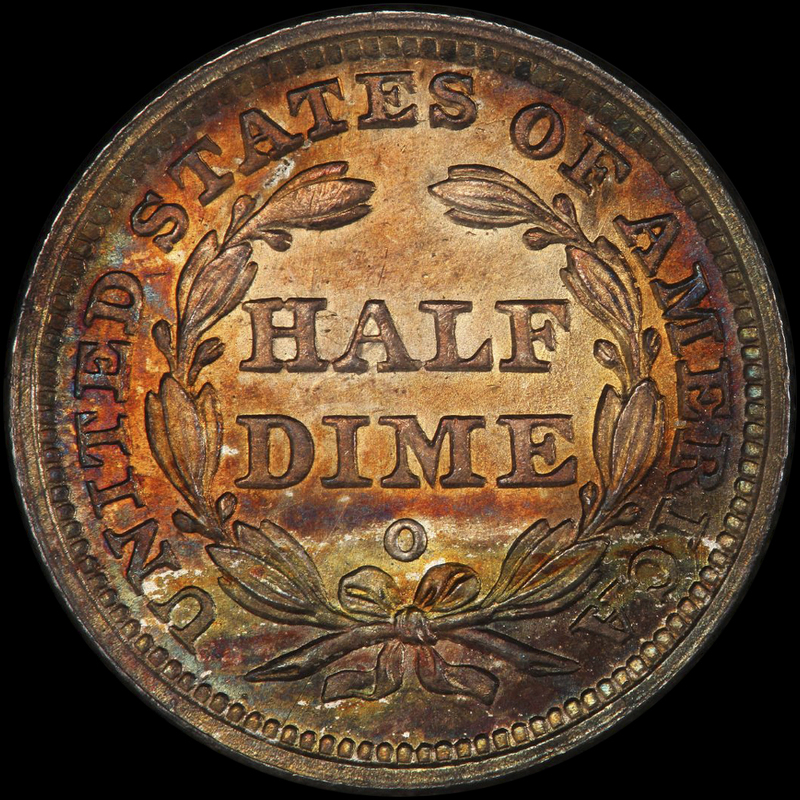 If you collect Half Dimes or really neat Type, this is a coin you need to see or own. In today’s market we figure the MS68 (which s CAC) at $35,000.00+-and its locked away in a world class collection.You can NOT get an equal or one better!